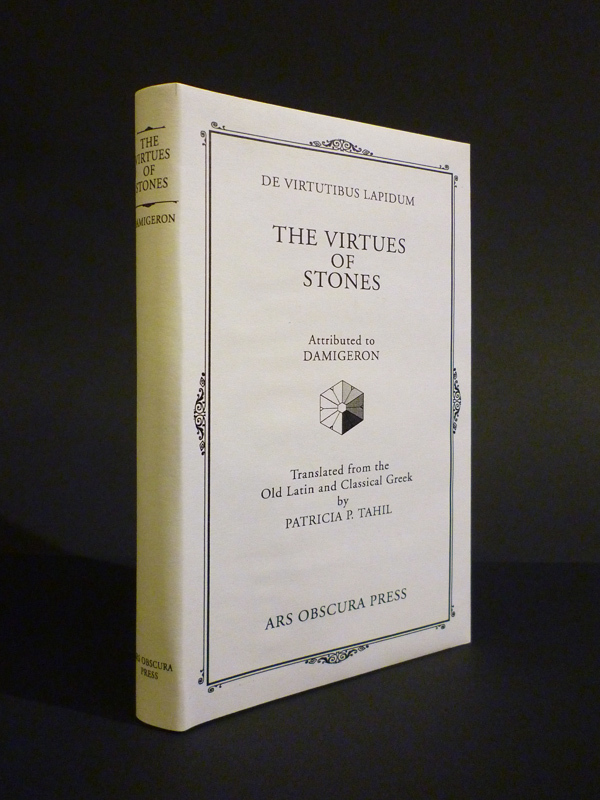 De Virtutibus Lapidum « Ars Obscura Bookbinding & Restoration Co. This first time in English translation, a veritable grimoire of gemstones, is a must for those into primary source materials! Dating from the Second Century B.C. in Arabia, this classic has been translated from the Old Latin and Classical Greek. An emphasis on completeness is exhibited in the publishing of this work; in this translation the original Latin and Greek are printed in the latter half of the book. Also included are the complete Latin footnotes. The luster from the blend of historical curiosity and the power of stones create a unique tone and brilliant insight into the diverse magickal/ritual and healing uses of gemstones. Fifty gemstones are mentioned. 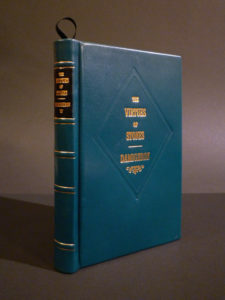 In the history of lapidaries, De Virtutibus Lapidum, by the Mage Damigeron represents one of our deepest roots of an ancient source of the base for our contemporary literature and knowledge on the magickal lore of gemstones. This is possibly the oldest in the West and Near East. ISBN: 0-9623780-3-8. 16 pp.,94 pgs., 4.25 x 7 inches. Type has been set in Jenson. Trade Cloth Edition, blue book cloth, gold stamp on spine with jacket. $50.00. 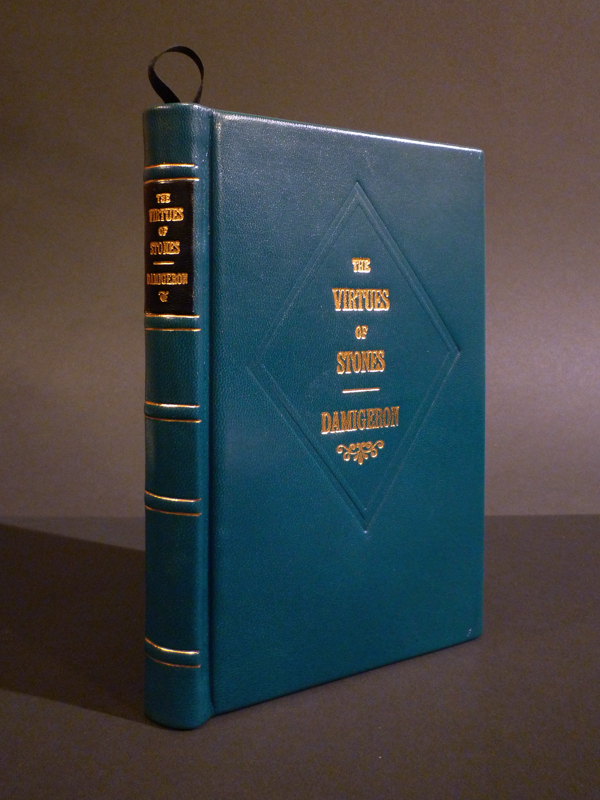 Library Edition, full leather binding in teal/turquoise kidskin. $110.00. ARS OBSCURA Bookbinding and Restoration Co. and guaranteed to outlive its owner. A full leather binding in teal/turquoise kidskin. Leather headbands and black silk ribbon. Sewn marble endpapers, also blue. This book is hand-sewn on 2 sawn-in cords. 5 raised bands and gold gilt title/author on the front cover. Blind stamp, diamond-shaped design frames the front cover gilt stamping. A lined (with matching marble paper) slipcase is available for $60.00, additional.